The view from inside the penthouse. A $30 million St Kilda penthouse has broken Melbourne's price record for the most expensive apartment sale after being contracted to Antony Catalano. Part of GURNER™'s 6-star Saint Moritz development, the $30 million apartment's price is 20 per cent higher than the previous Melbourne record and is the second highest in Australia, surpassed only by the $40m record price achieved for an apartment in Sydney. The penthouse, which is designed over 650 square metres internally and 150sqm externally, features seven bedrooms, a seven-car private garage with direct lift access, four living rooms, an in-home sauna, gymnasium and two private pools. It also includes a cascading two-storey water feature surrounded by marble-clad walls, a solid Nero Marquina bathtub with 180 degree water views, another internal pool that submerges into the rooms below , a floating fireplace, and a 1,000-bottle, temperature-controlled wine cellar, accessible via a sculptural spiral staircase. Developer Tim Gurner believes the penthouse's unparalleled amenity, along with the building’s design by award-winning architecture practice Fender Katsalidis ensured it achieved a record sale price. 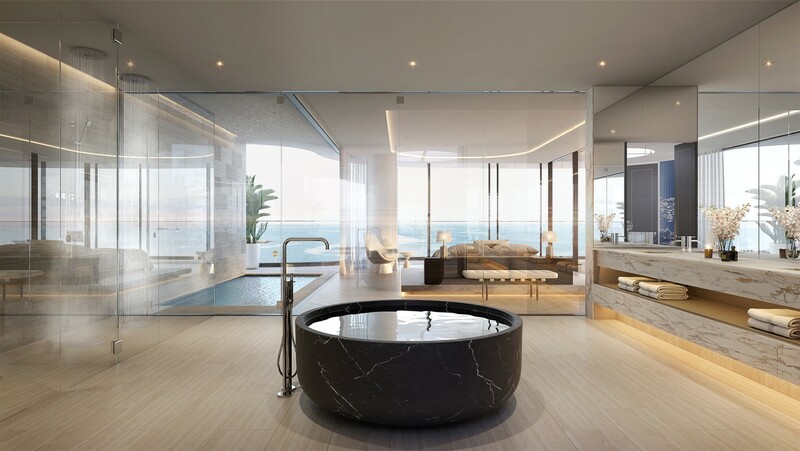 “This penthouse has been designed to be the best in Australia and arguably one of the best in the world,” he said. “We had no intention of selling the prized penthouse until the launch, but once word got out we were swamped with interested buyers – all local Melbourne identities who quickly realised this will be Melbourne’s and arguably Australia’s best residential address." “We had five interested buyers and two quickly became very competitive. We worked with the successful buyer to design and customise the penthouse with them before formalising the sale – a process that has now been completed. "The contracted price is under strict confidentiality but we had an asking price of $30million and it’s fair to say I am extremely happy with the result and I know our purchaser is also." The development, to be built on the site of the once-famed ‘Saint Moritz Ice Rink’ that operated from 1939 – 1981, promises to be Australia’s, and one of the world’s most exclusive and opulent residential addresses, featuring amenities for residents that exceed standards set in the most luxurious hotels in the world. The 6,000 sqm site, which currently houses the Novotel Hotel, will be transformed into three, ultra-luxurious 8-storey towers with fewer than 40 apartments per building. Saint Moritz will offer 120 private residences encompassing two, three bedroom, four, five and six bedroom offerings, with prices ranging from $1.4million to $30million-plus. The project is currently taking registrations of interest with sales to launch in mid-2019. Why are bond investors showing faith in Mongolia?